Stonehenge, on Salisbury plain in England, is one of the most recognizable monuments of the Neolithic world and one of the most popular, with over one million visitors a year. People come to see Stonehenge because it is so impossibly big and so impossibly old; some are searching for a connection with a prehistoric past; some come to witness the workings of a massive astrological observatory. The people living in the fourth millennium B.C.E. who began work on Stonehenge were contemporary with the first dynasties of Ancient Egypt, and their efforts predate the building of the Pyramids. What they created has endured millennia and still intrigues us today. In fact, what we see today is the result of at least three phases of construction, although there is still a lot of controversy among archaeologists about exactly how and when these phases occurred. It is generally agreed that the first phase of construction at Stonehenge occurred around 3100 B.C.E., when a great circular ditch about six feet deep was dug with a bank of dirt within it about 360 feet in diameter, with a large entrance to the northeast and a smaller one to the south. This circular ditch and bank together is called a henge. Within the henge were dug 56 pits, each slightly more than three feet in diameter, called Aubrey holes, after John Aubrey, the 17th century English archaeologist who first found them. These holes, it is thought, were either originally filled with upright bluestones or upright wooden beams. If it was bluestones which filled the Aubrey holes, it involved quite a bit of effort as each weighed between 2 and 4 tons and were mined from the Preseli Hills, about 250 miles away in Wales. The second phase of work at Stonehenge occurred approximately 100-200 years later and involved the setting up of upright wooden posts (possibly of a roofed structure) in the center of the henge, as well as more upright posts near the northeast and southern entrances. Surprisingly, it is also during this second phase at Stonehenge that it was used for burial. At least 25 of the Aubrey holes were emptied and reused to hold cremation burials and another 30 cremation burial pits were dug into the ditch of the henge and in the eastern portion within the henge enclosure. 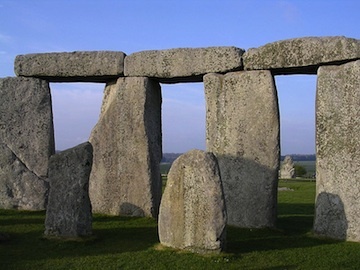 The third phase of construction at Stonehenge happened approximately 400-500 years later and likely lasted a long time. In this phase the remaining blue stones or wooden beams which had been placed in the Aubrey holes were pulled and a circle 108 feet in diameter of 30 huge and very hard sarsen stones were erected within the henge; these were quarried from nearby Marlborough Downs. These upright sarsen stones were capped with 30 lintel stones. Each standing stone was around 13 feet high, almost seven feet wide and weighed around 25 tons. This ring of stones enclosed five sarsen trilithons (a trilithon is a pair of upright stones with a lintel stone spanning their tops) set up in a horseshoe shape 45 feet across. These huge stones, ten uprights and five lintels, weigh up to 50 tons each. Bluestones, either reinstalled or freshly quarried, were erected in a circle, half in the outer sarsen circle and half within the sarsen horseshoe. At the end of the phase there is some rearrangement of the bluestones as well as the construction of a long processional avenue, consisting of parallel banks with exterior ditches approximately 34 meters across, leading from the northeast entrance to Stonehenge, dipping to the south and eventually to the banks of the Avon river. 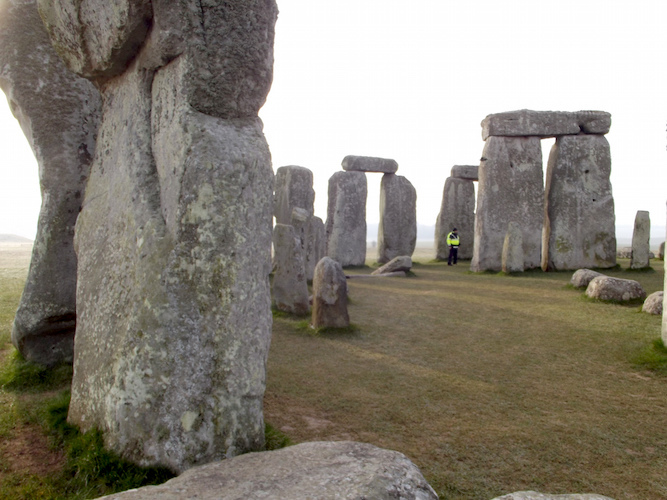 All three phases of the construction of Stonehenge pose fascinating questions. The first phase of work required precise planning and a massive amount of labor. Who planned the henge and who organized whom to work together in its construction? Unfortunately, remains of Neolithic villages, which would provide information about who built Stonehenge, are few, possibly because so many lie underneath later Bronze Age, Roman, Medieval and modern cities. The few villages that have been explored show simple farming hamlets with very little evidence of widely differing social status. If there were leaders or a social class who convinced or forced people to work together to build the first phase of Stonehenge, we haven’t found them. It also probably means the first phase of Stonehenge’s construction was an egalitarian endeavor, highly unusual for the ancient world. Who were the people buried at Stonehenge during its second phase? Recent analysis of these bones has revealed that nearly all the burials were of adult males, aged 25-40 years, in good health and with little sign of hard labor or disease. No doubt, to be interred at Stonehenge was a mark of elite status and these remains may well be those of some of the first political leaders of Great Britain, an island with a ruling tradition extending all the way to the House of Windsor. They also show us that in this era, some means of social distinction must have been desirable. The work achieved in the long third phase of Stonehenge’s construction, however, is the one which is most remarkable and enduring. Like the first phase of Stonehenge, except on a much larger scale, the third phase involved tremendous planning and organization of labor. But, it also entailed an entirely new level of technical sophistication, specifically in the working of very hard stone. For instance, the horizontal lintel stones which topped the exterior ring of sarsen stones were fitted to them using a tongue and groove joint and then fitted to each other using a mortise and tenon joint, methods used in modern woodworking. Each of the upright sarsens were dressed differently on each side, with the inward facing side more smoothly finished than the outer. 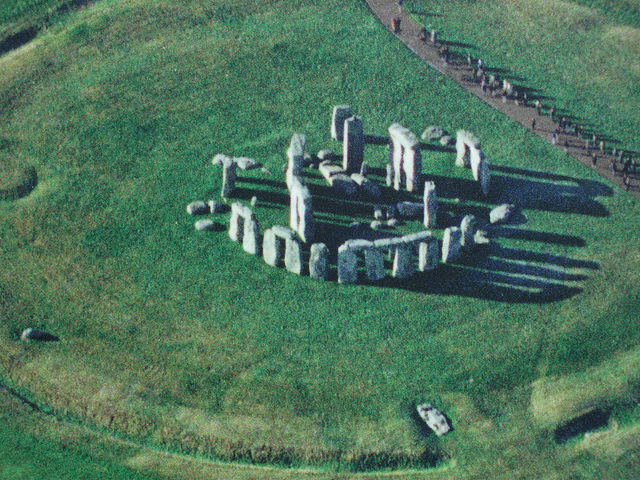 Moreover, the stones of the outer ring of sarsens were subtly modified to accommodate the way the human eye observes the massive stones against the bright shades of the Salisbury plain: upright stones were gently widened toward the top which makes their mass constant when viewed from the ground. The lintel stones also curve slightly to echo the circular outer henge. The stones in the horseshoe of trilithons are arranged by size; the smallest pair of trilithons are around 20 feet tall, the next pair a little higher and the largest, single trilithon in the south west corner would have been 24 feet tall. This effect creates a kind of pull inward to the monument, and dramatizes the outward Northeast facing of the horseshoe. Although there are many theories, it is still not known how or why these subtle refinements were made to Stonehenge, but their existence is sure proof of a sophisticated society with organized leadership and a lot of free time. A solar and lunar calendar? Of course the most famous aspect of Stonehenge is its relationship with the solar and lunar calendar. This idea was first proposed by scholars in the 18th century, who noted that the sunrise of the midsummer solstice is exactly framed by the end of the horseshoe of trilithons at the interior of the monument, and exactly opposite that point, at the center of the bend of the horseshoe, at the midwinter sunset, the sun is also aligned. These dates, the longest and shortest days of the year, are the turning point of the two great seasonal episodes of the annual calendar. Since this discovery, several other theories about astrological observation have been offered but few stand up to scrutiny together with the physical details of the monument. Cite this page as: Dr. Senta German, "Stonehenge," in Smarthistory, August 8, 2015, accessed April 22, 2019, https://smarthistory.org/stonehenge/.